The UFC is back in action, as Winnipeg, Canada plays host to this excellent card on big Fox! Headlining, is a title eliminator in the Welterweight division, pitting former Welterweight Champion Robbie Lawler against former Lightweight Champion Rafael dos Anjos. Lawler, most recently fought and defeated Donald Cerrone via decision. It was Lawler’s first fight since losing his Welterweight Championship to Tyron Woodley in July of 2016, as he took nearly year off. As for dos Anjos, the move up to the Welterweight division has been nothing but successful. In his debut, he defeated a very talented striker in Tarec Saffiedine via decision. That performance was followed up with a dominant first-round submission victory over Neil Magny. Now, dos Anjos has put himself in a position to fight for the Welterweight Championship and potentially become the fifth fighter to be a multiple weight Champion. 170 lbs. 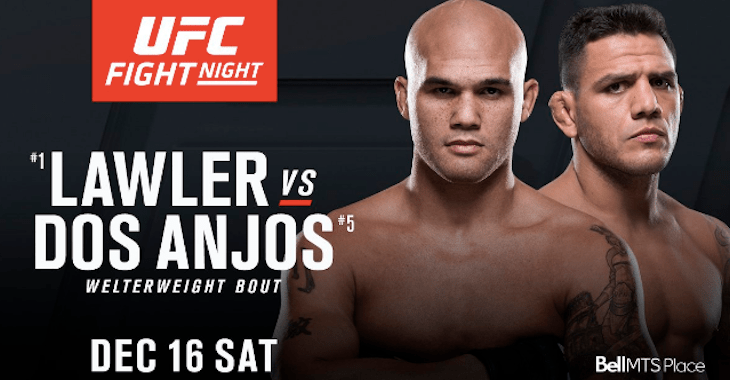 : Robbie Lawler vs. Rafael dos Anjos – The motherload! Two former Champions battling for an opportunity to fight for the Welterweight Championship next. However, I’ll be brief here, as I’ve got Lawler. I believe that dos Anjos has the abilities to turn this fight in his favor, using a heavy dose of leg kicks to halt the forward movement of Lawler. Mixing in well timed takedowns and smothering Lawler too should be within the gameplan. However, Lawler presents issues for dos Anjos. For one, Lawler’s got a 3′ inch height and 4′ inch reach advantage. He is heavy handed, perhaps the hardest puncher dos Anjos has faced to date. Lawler is also as durable as it gets, as he’s only been finished once in the past fourteen fights. Given that he’s fought Johnny Hendricks, Rory MacDonald, Carlos Condit, Donald Cerrone and others, some in five round fights, I’d say his chin in pretty solid. Anyways, I said I’d be brief. Lawler via second-round knockout. 145 lbs. : Josh Emmett vs. Ricardo Lamas – This is a big opportunity for both men, as Emmett has a shot to catapult himself into the top five with a victory over Lamas. Meanwhile, in my opinion, a victory for Lamas sets up a title eliminator against Brian Ortega. As for the fight, with Emmett missing weight, I expect cardio to wane during the later rounds. Lamas has cardio for days and is well, better than Emmett everywhere. I envision Lamas wearing down Emmett, eventually submitting him in the third round. 170 lbs. : Mike Perry vs. Santiago Ponzinibbio – This fight is pure fireworks. The addition of Mike Perry in the UFC Welterweight division has led some of the most brutal knockouts in UFC history. Perry aims solely to knock opponents out, even if it leads him to being reckless. However, that’s an issue, as Ponzinibbio feasts on opponent’s being reckless. Ponzinibbio is very athletic, a solid counter puncher and has knockout power of his own. In my opinion, Ponzinibbio can either win this fight either two ways. He keeps distance, using his speed to evade Perry and pick him apart for a decision victory. Or Perry charges in and gets put to sleep. I’ll go with the latter. Ponzinibbio via knockout! 205 lbs. : Misha Cirkunov vs. Glover Teixeira – This is an excellent fight, as Cirkunov is given an opportunity to bounce back against a top five fighter in Teixeira. Widely regarded as a future title challenger, Cirkunov stumbled in his last fight. He was knocked out in 28 seconds against current title challenger Volkan Oezdemir. Nothing in the business comes easy, but for your next fight to be against Teixeira was an easy choice to take. Teixeira, is coming off a “Fight of the Night” against Alexander Gustafsson. And despite eventually getting knocked out in the fifth round, Teixeira showed toughness, durability and determination. He would not go away and kept throwing to the very end. As for a prediction, while Cirkunov has the skills to win this fight, I believe the boxing and power of Teixeira will cause him to eventually wilt. If Cirkunov doesn’t attempt to smother Teixeira in the clinch, at times attempting takedowns, then he’s going to get caught on the feet. Contrary to belief, Teixeira tank is empty just yet. This fight is just the beginning to his last run for UFC gold. So with that, I’ve got Teixeira via knockout. 205 lbs. : Jan Blachowicz vs. Jared Cannonier – This is a great fight and a tough one to call. On one hand, I’ve liked Blachowicz’s improvements over his last two fights. He’s always been a solid striker, but his inability to stuff a takedown never allowed him to showcase that. Blachowicz often found himself on bottom, getting smothered for three rounds. However, his last fight in particular, he shrugged off several takedown attempts from his wrestling based opponent. A potential sign that Blachowicz can rid of a flaring weakness. In this fight though, there’s no need to worry about being taken down. Cannonier is a striker to the core, throwing every strike with intentions to knock you out. Cannonier is also very athletic, so the speed advantage should be evident. The pace he sets too is problematic for Blachowicz, as cardio has been an issue at times for the Poland native. So with that, I have Cannonier edging this one out via decision. 205 lbs. : Julian Marquez vs. Darren Stewart – Marquez will make his promotional debut, as he enters this fight on a four fight win-streak. Stewart is on the opposite spectrum, having lost two fights in a row and on the brink of being cut by the UFC. Usually I like to side with fighters with their back against the wall, but Marquez is a bonafide finisher. So with that, I expect Marquez to keep his 100% finishing rate in tact, winning this one via knockout. 170 lbs. : Galore Bofando vs. Chad Laprise – Bofando is fun addition in the UFC, as his spinning attacks and freakish athletic abilities align for some exciting finishes. However, with only seven professional fights, two losses via disqualifications, it’s clear he needs more time to grow. Hell, his last two opponents have combined for a 8-16 record. So with that, I have Laprise extending his win streak to three, as he wins via third-round TKO. 170 lbs. : Danny Roberts vs. Nordine Taleb – This is a tough fight to call, as Taleb is a massive welterweight. He’s also a very good striker, who implements a heavy dose of leg kicks to slow down opponents. His strength is apparent too, as he’s taken opponents down at a 79% clip. However, Roberts has been improving his takedown defense, which is key in this fight. On the feet, while Taleb is good, Roberts is better. He’s a slick boxer, who throws in volume and he’s got legit power in his hands. So with that, I’m going to side with Roberts to win the striking battle en route to a decision victory. 155 lbs. : John Makdessi vs. Abel Trujillo – At one point in time, Trujillo looked the part of a contender in the UFC. With power in his hands and a wrestling base, Trujillo has put forth an excellent 6-3 record inside the octagon. However, his weakness is glaring. He can’t sustain a pace, as his cardio wanes the later the fight goes. It’s exactly why I’m siding with Makdessi too, as the “Bull” has no issues with cardio. Also, his style of keeping distance and countering should work well against Trujillo. Depending on if Trujillo aggression in this fight, this could either result in a knockout both ways or my prediction that Makdessi out-strikes Trujillo en route to a decision victory. 185 lbs. : Oluwale Bamgbose vs. Alessio Di Chirico – The fact that Di Chirico couldn’t finish Garreth McLellan, tells me that Bamgbose is going to have the full three rounds to finish this fight. With a 100% finishing rate, all via knockout, I’ve got to go with Bamgbose to get this one done inside the distance. Bamgbose via knockout! 170 lbs. : Jordan Mein vs. Erick Silva – This bout reeks of pink slip, as Mein enters this fight on a three-fight losing streak. Meanwhile, Silva has three of his last four fights. A shame, given that both men came into the UFC with potential to be contenders. Hell, at one point everyone thought that Silva would be a future Welterweight Champion. As for a prediction, I’ve got Mein. Every since USADA partnered with the UFC, Silva’s body completely transformed for the worse. So did his performance, which is why I’ve got Mein via third-round knockout.